Pressure Relief Technology Allows Fluid and Air to Escape. SKU: GT-032-A. Category: Rotary Broach Tool Holders. Polygon’s Award-Winning rotary broach tool holder is the perfect solution for lathes, mills and turning machines. Less clunky than traditional screw machine era broach holders, Polygon’s innovative broach holder streamlines the set-up process and includes new features to save you time and money. Polygon’s GT-032-A (GT032A) rotary broach tool holder is the perfect solution for lathes, mills and turning machines. Less clunky than traditional screw machine era broach holders, Polygon’s innovative rotary broach holder streamlines the set-up process and includes new features to save you time and money. The broach holder has a free turning spindle that holds a rotary broach fastened with a simple set screw at a one degree angle to the pilot hole. As the broach turns or rotates with the part, each tooth eventually makes contact in a helical motion. As the broach is fed into the pilot hole, eventually the full form is cut. The same holder works in a mill. 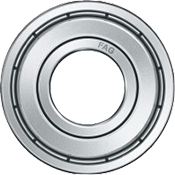 Polygon’s high quality FAG brand sealed bearings provide the quality required for today’s demanding machinists and their machines. For more than 120 years, the Schaeffler Group’s FAG brand has been one of the leading manufacturers of precision bearings for the automotive, mechanical engineering and aerospace industries. 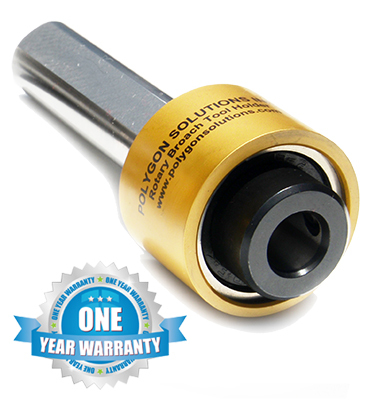 Polygon’s GT series broach holder is a premium tool that will never include inferior bearings. Sealed bearings save you from having to grease the holder every one or two hours (as recommended for screw machine era holders). 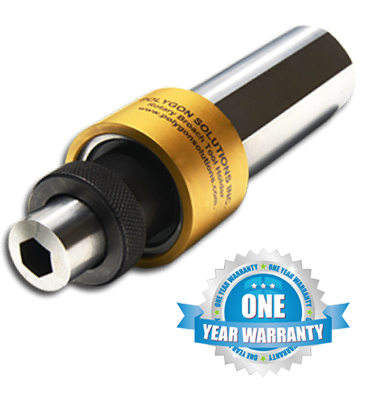 The superior quality of the seals is backed up by the broaching industry’s only ONE YEAR BROACH HOLDER WARRANTY. Additionally, you will not need to purchase, store and inventory costly grease guns, tubes and work instructions. The award winning design of the GT broach holder also includes a pressure relief system. Each standard broach includes a through hole that allows coolant, cutting oil and air to escape when broaching blind holes. The fluid and air escapes through a port on the side of the rotary broach holder. 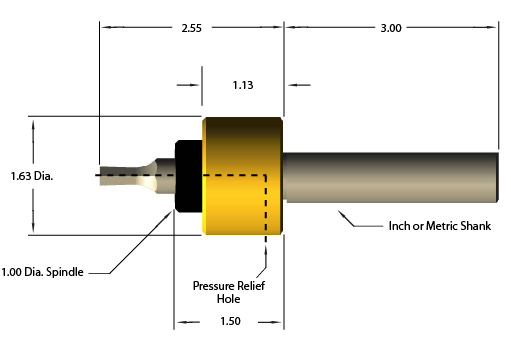 Relieving pressure is a critical operation for improving cutting tool and machine life. Polygon’s rotary broach holder does not require any adjustment and is designed with an easy plug-and-play feel. The fixed length broach is locked into the spindle with a simple set screw. The GT rotary broach holder is suitable for experienced machinists and new operators. No machine is prefect, and many have slight misalignments between the part and the tool holders. Polygon’s innovative rotary broach holder is designed for this situation and has a small amount of endplay. The high quality bearing allows the broach to center itself in the chamfer before broaching the finished hole. 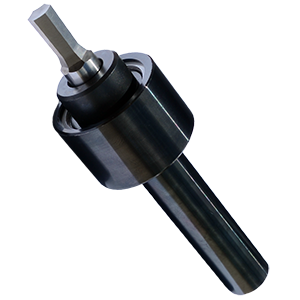 Polygon’s rotary broaching tool holder also has a small work envelope and round body. Because there are no sharp corners, edges or grease fittings protruding from the body, crashes and injuries are minimized. The small work envelope insures compatibility with smaller machines and tight set-ups. The GT holder is available with a variety of different straight shank sizes and spindles to fit your machine. If you are already using 8mm shank x 1.25” length Swiss type rotary broaches please order the A spindle version of the broach holder. The B version of the broach holder is for .500” shank broaches and offers the largest capacity. The straight shank to mount in the machine is available in metric and inch sizes. The inch sizes are 5/8”, 3/4″, 1”, 1-1/4” and 1-1/2”. The metric sizes are 16, 20, 22, 25 and 32mm. Adaptors can be used to fit Morse Taper, CAT 40 and other mounting configurations.